Chicken Frick 'A Zee: Chicken Broth, Chicken (A Combination of Boneless, Skinless, White Breast and Other Cuts of Chicken), Locust Bean Gum, Tricalcium Phosphate, Sunflower Seed Oil, Xanthan Gum, Fish Oil, Guar Gum, Potassium Chloride, Choline Chloride, Taurine, Vitamin E Supplement, Zinc Sulfate, Thiamine Mononitrate (Vitamin B1), Nicotinic Acid (Vitamin B3), Calcium Pantothenate, Vitamin A Supplement, Potassium Iodide, Manganese Sulfate, Ferrous Sulfate, Vitamin D3 Supplement, Riboflavin Supplement (Vitamin B2), Pyridoxine Hydrochloride (Vitamin B6), Copper Sulfate, Folic Acid, Vitamin B12 Supplement. Funk In the Trunk: Chicken Broth, Chicken (Boneless, Skinless, White Breast), Tuna, Pumpkin, Sunflower Seed Oil, Locust Bean Gum, Tricalcium Phosphate, Fish Oil, Guar Gum, Xanthan Gum, Potassium Chloride, Choline Chloride, Taurine, Vitamin E Supplement, Zinc Sulfate, Thiamine Mononitrate (Vitamin B1), Nicotinic Acid (Vitamin B3), Calcium Pantothenate, Vitamin A Supplement, Potassium Iodide, Manganese Sulfate, Ferrous Sulfate, Riboflavin Supplement (Vitamin B2), Pyridoxine Hydrochloride (Vitamin B6), Vitamin D3 Supplement, Copper Sulfate, Folic Acid, Vitamin B12 Supplement. Goldie Lox: Chicken Broth, Chicken (Boneless, Skinless, White Breast), Tuna, Salmon, Sunflower Seed Oil, Locust Bean Gum, Tricalcium Phosphate, Guar Gum, Xanthan Gum, Fish Oil, Potassium Chloride, Choline Chloride, Taurine, Vitamin E Supplement, Zinc Sulfate, Thiamine Mononitrate (Vitamin B1), Nicotinic Acid (Vitamin B3), Calcium Pantothenate, Vitamin A Supplement, Potassium Iodide, Manganese Sulfate, Ferrous Sulfate, Riboflavin Supplement (Vitamin B2), Pyridoxine Hydrochloride (Vitamin B6), Vitamin D3 Supplement, Copper Sulfate, Folic Acid, Vitamin B12 Supplement. 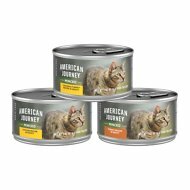 The Double Dip: Chicken Broth, Chicken (A Combination of Boneless, Skinless, White Breast and Other Cuts of Chicken), Beef, Beef Lung, Locust Bean Gum, Sunflower Seed Oil, Tricalcium Phosphate, Xanthan Gum, Fish Oil, Guar Gum, Potassium Chloride, Choline Chloride, Taurine, Vitamin E Supplement, Zinc Sulfate, Thiamine Mononitrate (Vitamin B1), Nicotinic Acid (Vitamin B3), Calcium Pantothenate, Vitamin A Supplement, Potassium Iodide, Manganese Sulfate, Ferrous Sulfate, Vitamin D3 Supplement, Riboflavin Supplement (Vitamin B2), Pyridoxine Hydrochloride (Vitamin B6), Copper Sulfate, Folic Acid, Vitamin B12 Supplement. Feed according to the age, size and activity of your cat. If fed alone, feed 1 oz for each lb of bodyweight daily, best fed twice a day. Your cat should have access to clean, fresh water. Refrigerate after opening. Huge fan of Weruva products! My non-picky cat has been thoroughly enjoying this food – he cleans his plate (something he hasn’t been doing lately). You can visually see meat pieces with this food and that thrills me, since it makes it look more like “real” food. These cans last us a few days, since he only gets a scoop or two twice a day, and I can easily store the excess in the fridge with a reusable cover. Despite it being cat food, there’s no harsh smells. It’s a bit on the pricy side, but I’m happy with it and he enjoys it, so that’s really all that matters! My cat is approximately 12-13 years old and has never been to the vet. She is so healthy and I believe it is because I feed her good healthy food. 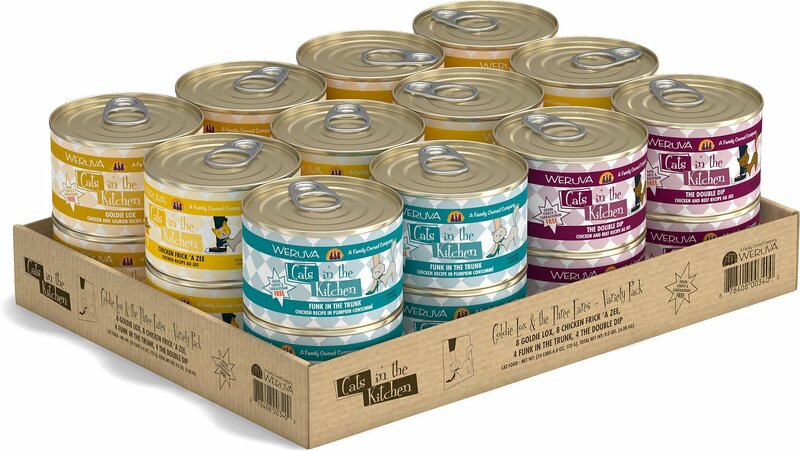 She loves every flavor of Weruva cat food, and getting it delivered to my door is a real plus! The cost is just a little bit more than buying it in the store, but worth the delivery! 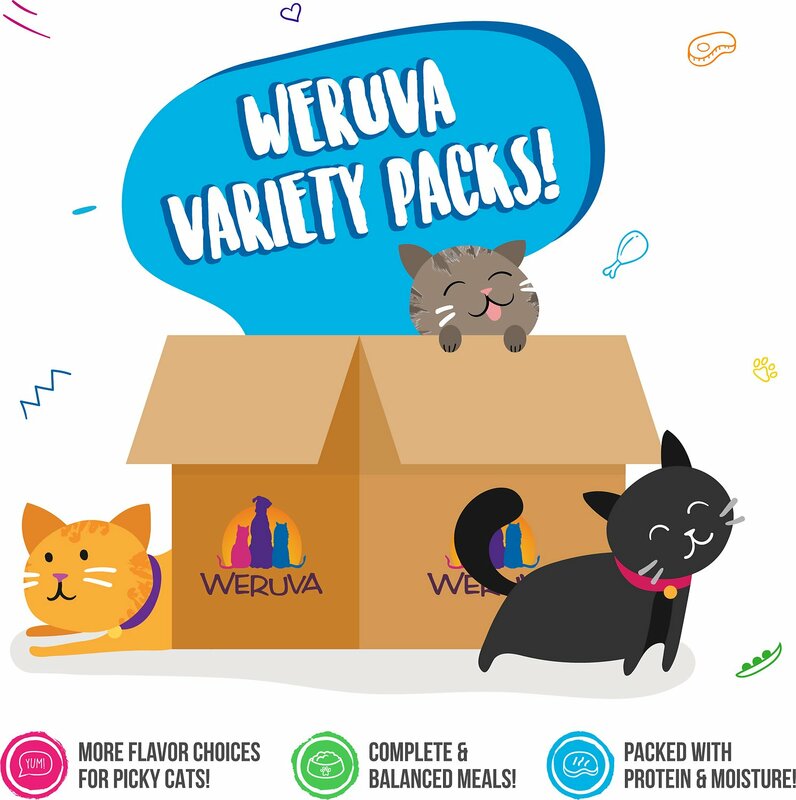 I bought this Weruva variety pack so my cats could try out some new Cats in the Kitchen flavors - it was a combination of 4 flavors so I assumed the 24 pack would be 6 of each but it’s actually split 8/8/4/4. The Weruva carton listed the contents accurately but the Chewy description didn’t list the count for each flavor - I’d suggest adding that information to the product’s online listing to help prospective buyers. Max has had urinary tract issues. He was hating his food and loosing weight. At my vets recommendation, I switched him to Weruva and now he’s thriving. Back to his old kitten self( and he’s 13). I wish we would have switched sooner. The food is nice quality and identifiable. 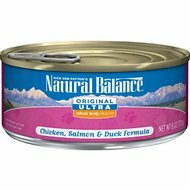 My daily meal plan is a quarter can each with two tablespoons of dry, in the AM and the PM for my nine year old previously feral cats. Domesticated at about 6-8 weeks.. Typically there was a fair amount of dry left. Well, they love Weruva, and having bought the variety pack, there not one that’s resulted in any leftovers. Wholeheartedly recommend! 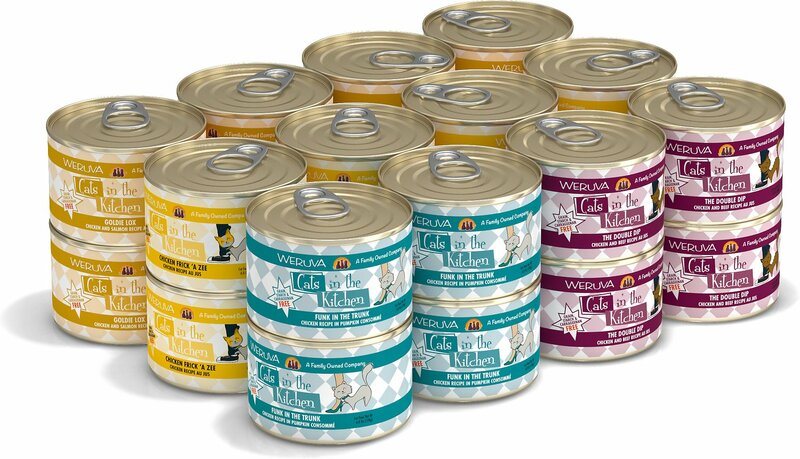 I have 4 cats and they all love this wet food. I love the size of the container and how it seems more like human food than other cat foods I have tried. Seriously, the chicken almost seems like can chicken I would eat. Got for free in exchange for a review. Other than licking to taste the food, my cats would not eat it. The ferals that I help feed liked the food. Although, they did have a bit of trouble with the "Funk in the Trunk" flavor because of the pumpkin consomme. My cats like Weruva a lot, but this pack came with 5+ cans significantly dented. I would buy in a store where you can still see all the cans are in good condition. 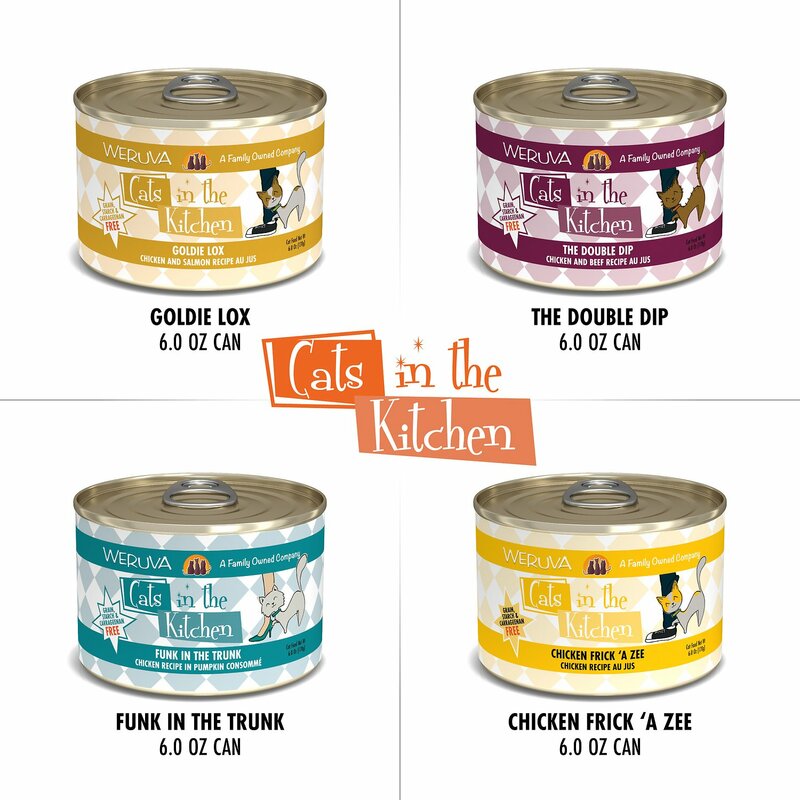 All 4 of my cats adore this stuff! It also keeps them full! on friskes and Purina theyd eat and be screaming for food 30-45minutes later. with weruva they actually wait until their meal time to ask. They scream for it at meal time. One of my cats is very picky too and she loves all the flavors. I also know my cats are eating healthy. FYI cats dont like cold food! so take it out of the fridge a few minutes before serving! they are natural carnivours and love warm fresh feeling food.